Every week we bring you the latest cruise news stories, articles we’ve published, our latest Cruise Radio podcast, and our recent YouTube videos. 1. 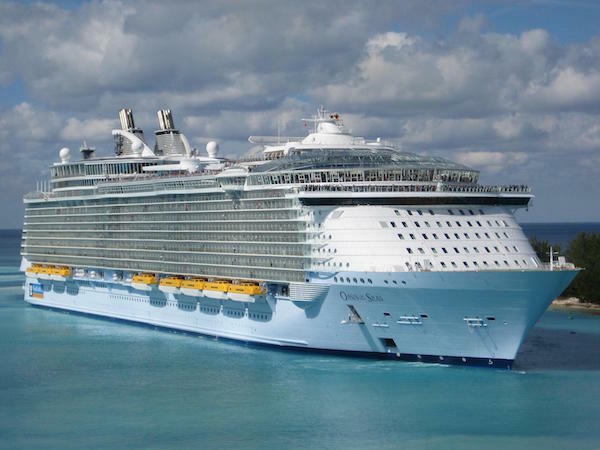 Royal Caribbean’s Oasis of the Seas was forced to return to Florida earlier than scheduled due to a norovirus outbreak onboard this week. By the time the ship arrived in Falmouth, Jamaica, on Wednesday, over 150 people were sick and all excursions were cancelled, so the ship skipped Jamaica and left for Cozumel. However, when the number of sick rose to 277, the ship decided to return home altogether. Cruisers were offered a 100% refund for the loss. 2. Cozumel was struck by violence this week when seven people were murdered near Playa del Carmen, the mainland destination traveled to by visitors to Cozumel. The incident occurred just 10 minutes from some popular tourist spots, serving as a reminder to cruisers to exercise caution when visiting new locations. The violence is suspected to be a result of the Jalisco drug cartel moving into the region. 3. Carnival Cruise Line was quick to reverse its new room service policy this week. At the start of 2019, Carnival announced a new à la carte room service menu on which the only remaining complimentary order was continental breakfast. However, in the wake of the immediate backlash, Brand Ambassador John Heald took to his Facebook page to say that Carnival would be “making some adjustments” to this new plan and menu. Until the new plan is revealed, the complimentary menu remains in effect. 5. Viking Cruises just announced a 161-day world cruise aboard Viking Sun. Beginning in Miami on December 14, 2020, the ship will visit six continents and 75 ports of call, including first-ever stops in Hawaii and Nawiliwili for Viking. When Carnival cruisers took to social media to voice their frustrations with the new room service menu, they took them out on the wrong guy: Brand Ambassador John Heald. Instead of keeping their frustrations related to the new menu, some people actually stooped to insulting John and his family. This week Tony and Jenny join the show to offer a review of Carnival Elation. Their five-night cruise from Jacksonville stopped in Nassau and Half Moon Cay. Carnival Elation leaving Jacksonville, Florida for the Bahamas. When too many passengers fell ill this week on Oasis of the Seas, the ship was forced to return to Florida a day early for extra cleaning. Our video breaks down what norovirus is, how it gets on a cruise ship, and how to avoid catching it.